Just answered the phone and as I approached the dining room window to pick up the receiver, I thought I could hear waxwings. Looking out of the window, there were 27 waxwings in the top of the oak tree in the garden. I once saw two fly over but this is the first time they’ve landed. Unfortunately, they didn’t visit the berberris just outside the window and instead flew off south over Ryhill. There’s certainly plenty around but still highly mobile. Eddie just mailed me to say there were also 42 waxwings at Pugneys this morning, unfotunately flushed by a dog walker! There have also been a pair of goosander on the Calder by Chantry Chapel and these are giving great views. Wow! 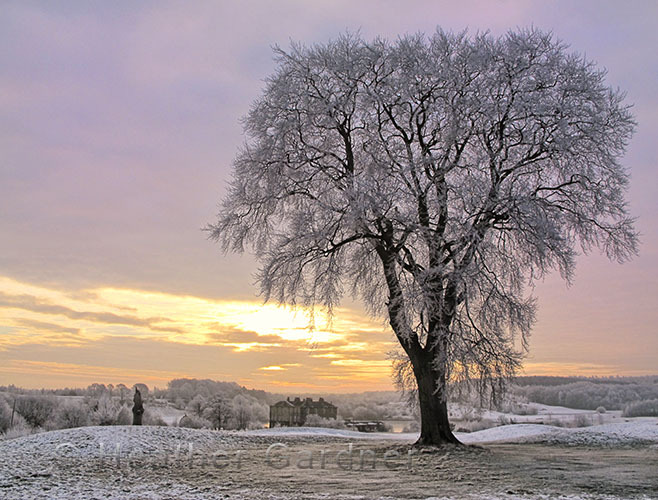 Heavy hoar frost and cold temperatures today! As I drove down to my studio I noticed half a dozen waxwings in the trees at the entrance to Redcats factory at Crigglestone. 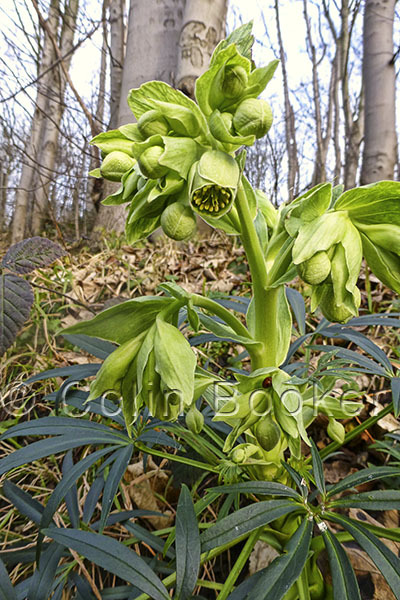 On a walk around Brockodale YWT reserve today, Colin Booker came across this fine example of stinking helibore (Helleborus foetidus), a local speciality plant which gets it’s name from the unpleasant odour given off when its leaves are crushed. Colin has supplied a really nice shot of the rare flower taken from a lovely low viewpoint to give us a good view of the typically drooped flower heads. He also noted 4 corn buntings at the reserve, now very scarce in the Wakefield district. The first indoor meeting of 2013 was the AGM where, after the formal part of the meeting was over, president John Gardner spoke about the recent committee meeting, where a discussion of the peregrines on Wakefield cathedral took place and the result was that the society agreed to finance the construction of a peregrine nestbox to be fixed on the Cathedral tower, subject to approval from the Cathedral authorities. As is now traditional, a wildlife quiz followed, with Francis Hickenbottom displaying his fascinating collection of skulls and feet, and our botanical expert Chris Hartley testing our brain cells even further with a group of tree branches, minus their leaves, for us to try and identify. John Gardner’s photographic quiz was as usual most interesting and frustrating. was unusual for the time of year. will give a talk entitled ‘Flight ’in the Quaker Meeting Hall, Thornhill St.Wakefield. The next meeting is the AGM on January 8th. While AGMs are a necessary evil and at many clubs are noted for being as dry as cabinet full of old moth specimens, the Wakefield Naturalists’ AGM breaks the mould with a fun-filled evening following the 10 minutes or so of business! After the refreshment break there will be a brain-taxing quiz to find out who should replace Packham on Springwatch 2013, so come along and make sure you’ve had a brainfood tea and bring an asprin for afterwards! A barn owl was seen hunting the edge of the fields between Cold Heindley and Wintersett reservoir at dusk this evening.